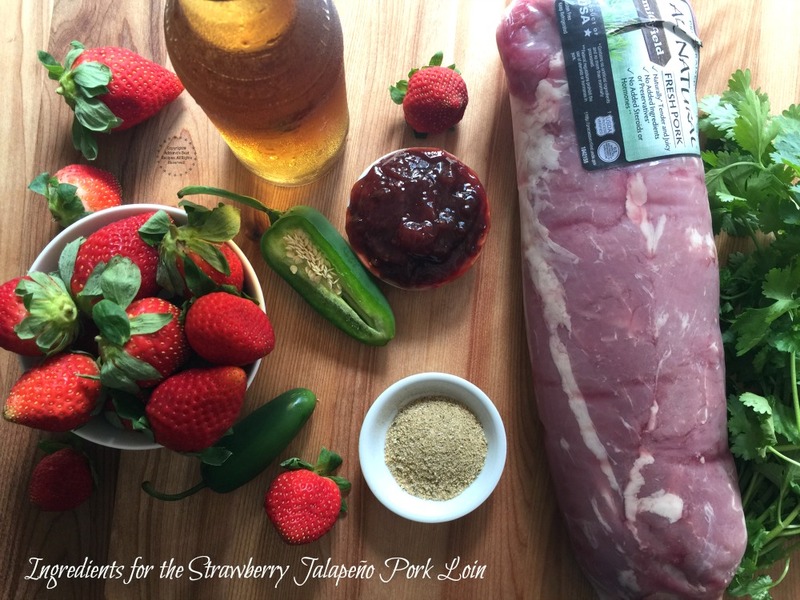 This recipe for the strawberry jalapeño pork loin is part of a sponsored collaboration with National Pork Board and DiMe Media. However, all opinions expressed are my own. Valentine’s Day dinner menu includes a Strawberry Jalapeño Pork Loin. Made with fresh lean pork loin, strawberry jalapeño preserves, strawberry beer and latino spices. Then served over a bed of field greens and garnished with tangy fresh strawberry jalapeño salsa. A romantic dinner for two needs to have many elements to set the mood for romance and spice. 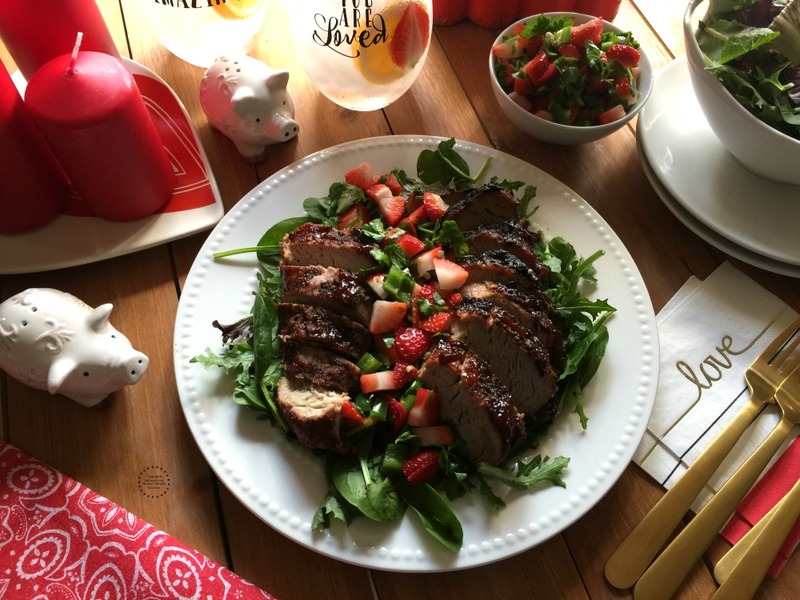 And this Strawberry Jalapeño Pork Loin has the right balance of sweet and spicy to bring it all together. Valentine’s Day dinner menu includes a Strawberry Jalapeño Pork Loin. Made with fresh lean pork loin, strawberry jalapeño preserves, strawberry beer and latino spices. In a rectangular baking pan add the pork loin and spread with the jalapeño strawberry preserves. Season with the latino spices and pour one cup of the strawberry ale. Cook inside the oven for 30 minutes at a 450 degrees Fahrenheit. If you love your pork medium rare, you should cook it to an internal temperature of 145 degrees (followed by a three-minute rest). If you like your pork a little more done, you can cook to an internal temperature of 160 degrees. Slice and place the cooked pork loin over a bed of field greens and garnish with fresh jalapeño strawberry salsa. When cooking pork use spice rubs or fat-free marinades or juice to add additional flavor without adding extra fat. The popular and delicious pork ribs and pork loin are great options for grilling or roasting. Look for your favorite lean cuts in the meat case. Many of these cuts meet USDA’s guidelines for “lean,” which means they have less than 10 grams of fat per serving, such as the Pork Tenderloin. Save the pork drippings for using as a savory sauce to dress the pork. Find the recipe for the fresh jalapeño strawberry salsa HERE. Watch the video to learn how to make this lovely recipe. 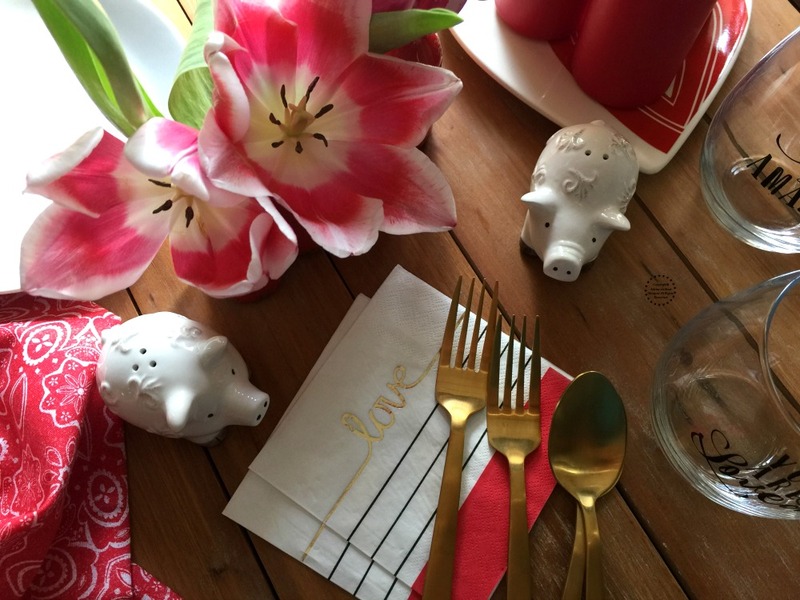 For the decor suggesting fresh hot pink tulips with red undertones, red napkins, gold silverware, white plates, glasses with love quotes and Valentines paper napkins. Adding to the set up red candles too. There is nothing more romantic than a candlelight dinner. Depending on the weather, the setup can be done indoors or for an al fresco experience. Florida is offering us cold pleasant nights so it is always welcome to serve dinner in a lanai or in a balcony for an intimate setting. For beverage options the suggestion is icy flavored water with fresh strawberries and slices of meyer lemons and a nice merlot wine to pair with the Strawberry Jalapeño Pork Loin dish. This dinner is not heavy and has enough lean protein, fruit and veggies to make it a sensible option to serve your better half. Pork is flavorful, versatile, healthy, easy to make, accessible and a great value. 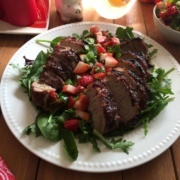 Today and every day enjoy “El Sabor de Hoy” with flavorful and easy to prepare pork recipes like this Strawberry Jalapeño Pork Loin that is ready in just few minutes. And for all pork lovers the National Pork Board has invited internationally recognized Latino actor, singer-songwriter and host, Carlos Ponce, to heat up kitchens across America and bring “El Sabor de Hoy” to life with a national sweepstakes giving fans a chance to win a round trip to Miami and meet Ponce as his quest at one of the country’s largest food events, the South Beach Wine & Food Festival. To participate, fans can visit PorkTeInspira.com to enter. Oh my! This looks absolutely delicious. I never would have thought to put jalapeno and strawberry together. The sweet and spicy are mouth watering. Sweet and spicy is such a great combination isn’t it?! I love pineapple with jalapenos so I’m sure I’d love strawberries– YUM! Love this recipe! Such a neat idea for the coming holiday! Great for eating in, and not too stressful on a budget, and you give great decorating ideas, too! We cook a lot of pork at home, we will definitely be trying this recipe out! I don’t eat pork but it would be awesome to serve this in dinner parties especially if you’re celebrating something special. It’s a lovely recipe! That’s one easy recipe that I won’t have any trouble doing. I wouldn’t mind serving this up when there’s a gathering! YUM! I absolutely love pairing a sweet berry with jalapenos. They work so well to balance each other out and create a sweet heat. I also love cooking pork instead of beef so this is right up my family’s alley. This is a gorgeous dish! I love how you used strawberry beer/ale. What a great combo with pork. never thought that meat and straweberry would match! very nicce! I’m crazy about this recipe! I never thought about combining strawberries, jalapeno and pork loin but I want to try it out. The combo of flavors is very interesting! Mmmm! Now doesn’t that look beautiful! The quintessential Valentine’s Day meal and I just love all of your decorations and plating! Pork with the combination of these flavours would be so delicious. Loin is one of my favourite cuts to use. Sweet with heat is great!! 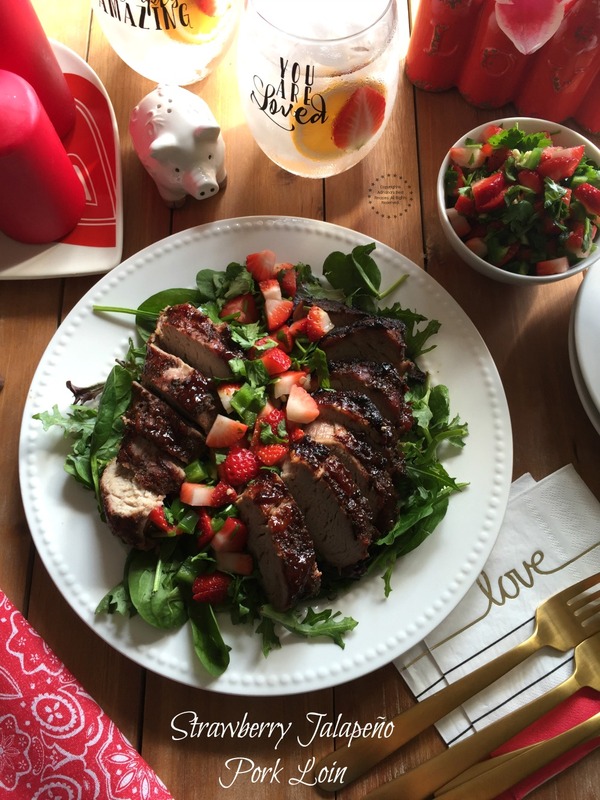 Such a beautiful idea, I love the idea of strawberries and pork together! The creativeness of this recipe is astounding! Never in a million years would I have thought of pairing strawberry with pork. Truly delicious sounding recipe. Love your tablescape, too. I love those salt shakers. Piggies are my favorite! This is not a combo I would have expected in a pork loin. It sounds incredible though! Wow. That’s a very fancy looking meat platter with very simple ingredients! Wonderful combination of strawberries and jalapenos, it must give such a great flavour to the pork loin, I must confess I would have never thought they could work so well together. Surely a great dish for Valentine’s Day or any other romantic dinner, delicious and so healthy too. That would be an interesting splash of flavors. Sweet, spicy, tangy all in one bite. I have to try this recipe. Looks like it will be another family favorite. Oh I love recipes that take ingredients you wouldn’t think of and combine them for a whole burst of flavor! What a perfect Valentine’s Day idea. I’m adding it to my shortlist! Awe a new way to make my pork loin! I’ve never had strawberry jalapeño salsa but it sounds inviting. I have never heard of a strawberry glaze on a pork loin and I can’t wait to try it! The sazon latino might be hard for me to find as a mix, but the ingredients are simple enough. Would you happen to know the amount of each spice in the mixture? Hi Byron thanks for your kind comment. The sazon latino you can find in many stores including Walmart hispanic aisle as well as Amazon. There are many brands like Badia and Goya. If you prefer to make your own you will be safe by doing 1 teaspoon of cumin, 1/2 teaspoon of oregano, 1/3 teaspoon of salt and 1/3 black pepper. Combine and add to a shaker or an empty spice bottle. I love strawberries and jalapenos together. Never would have thought about pairing them with a meat main dish though. This looks amazing!! What a great use of strawberries in multiple ways! I can totally see this dish as the perfect Valentine’s dinner. My husband loves everything sweet and spicy and he would love the jalapeno strawberry flavor. That is a wonderful dinner! I cook pork loin pretty often, as it takes so well to seasoning. But I love this combination! The strawberries balance the heat beautifully. And, for that matter, I’ve been using fruit in savory recipes, so this is the next step! I love these flavors together! Your presentation with the berries is so pretty – I bet you had no leftovers! I love sweet and spicy flavors and the Latino sazon must add a great pow to this dish. Having a chance to meet Carlos Ponce in Miami sounds dreamy too!! Nice table set up for a romantic dinner! 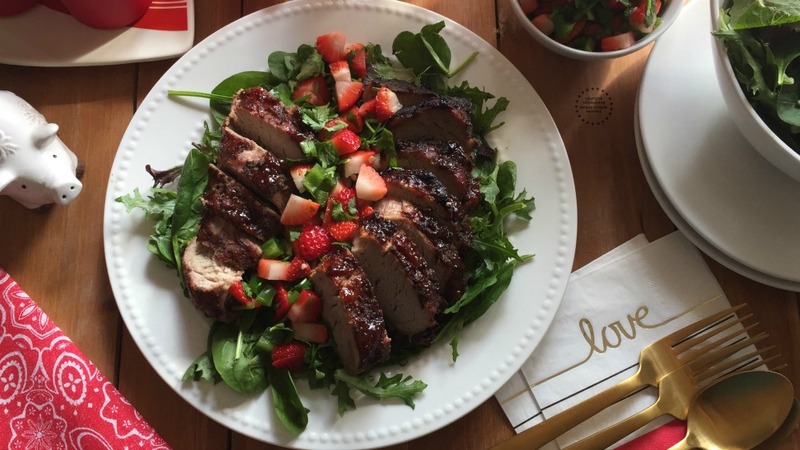 I love anything that involves strawberry, but we don’t use Pork at home, but I would love to give this a try using beef or chicken. The recipe looks delicious and very easy to do as well. Sweet & spicy are such a great combination. I know this will be a favorite with my family. Maybe the strawberry would be a good Valentine’s Day meal. Oh wow! I bet the fresh strawberries add a lot of fruity deliciousness!! I definitely think we’d like those flavors with pork loin! This would be an amazing spring recipe for us. Omg can we say yum?!?! This pork loin looks absolutely delicious!! I must give your recipe a try!!! 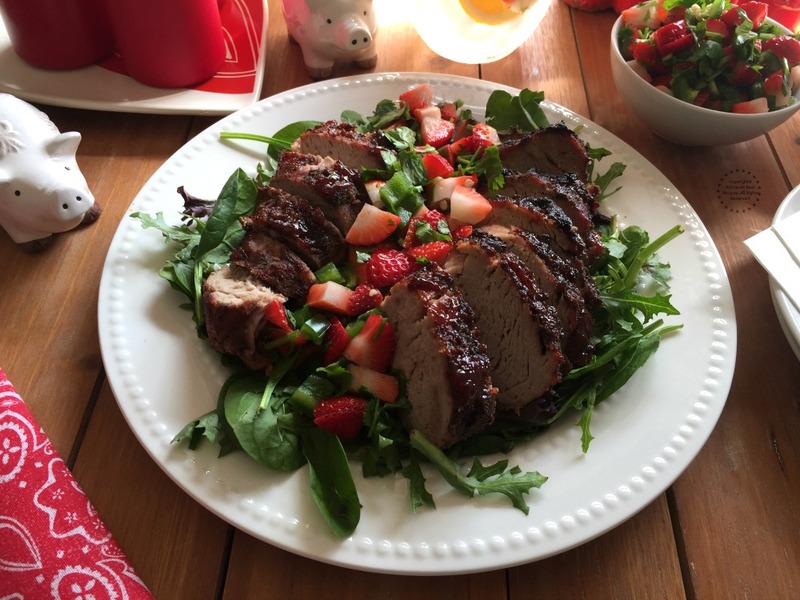 The strawberry jalapeno pork loin is so festive. I like the idea of using this recipe for Valentine’s Day. The strawberries look so delicious in the dish. I want to try this recipe for my hubby. What a gorgeous plate for Valentine’s Day! I’m sure it would be a hit! This pork loin looks so juicy and delicious. My husband is a huge meat eater so he would love this recipe. This is really good! I’ve had this at a friends house and it has always been a really great treat to have on special occasions! Im not a huge pork person but this does look good! I will pass this along to my mom she would love it!